B-Boying is a highly expressive dance developed in the Bronx of New York City, USA. However, B-Boying can be traced back to the early days of the 19th century when Folk, Tap, and Jazz were very popular. B-Boying is also known as Breaking or Breakdancing and the dancers are called B-Boys or B-Girls. It’s one of many dances that crossover with Street Dance and Hip Hop, but the key difference is dancing on the breakbeats or ‘Bs’. Why do we teach B-Boying? B-Boying is one of the cornerstones of Hip Hop and Street culture. B-Boying helps develop a whole new set of muscle groups, resulting in a fluidity of movement that is highly expressive and dynamic. 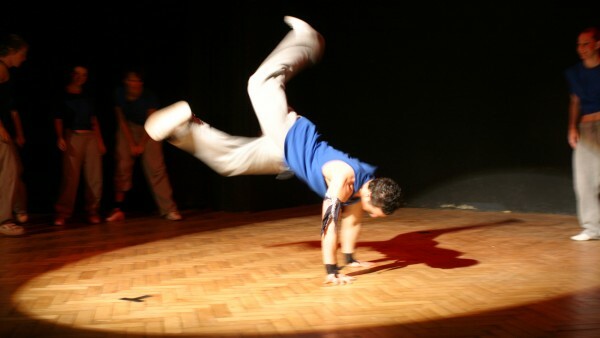 As B-Boying is synonymous with Street and Hip Hop culture, it is often used in advertising campaigns and music videos. Knowing B-Boying will help you master Street, Hip Hop and Locking moves, too. B-Boying has definitive Toprock, Footwork, and Freeze moves. A basic Toprock (upright) move, the Indian Step is characterized by folding, opening, and finally crossing arms across the body in one fluid, expressive movement. The Back Spin is a Footwork (ground) move that requires lots of momentum and circular motion. The Back Spin involves spinning on your back with your legs held tight to your body. Freeze moves are often used to end a move. The Chair Freeze is characterized by being supported by one leg and one arm, while almost lying, frozen, on the floor. If you’d like to talk with Angela, our lovely Course Director, about the B-Boying moves you’ll learn on our commercial dance courses before you apply, please get in touch on 0207 118 1818.